The Valjoux 7750 is the most popular automatic chronograph movement, yet it’s not universally loved. It’s dismissed for its mass-produced, low-tech cam-based design and utilitarian look, yet the Valjoux 7750 is also one of the most reliable and widely-used movements in history. The 7750 is often used in ways it was never intended. It powers watches from some of the top brands, and is even used as a simple timekeeper, with the chronograph functions disabled. But perhaps the most curious use of this ubiquitous workhorse is as a base for high-end column wheel (also called “Swiss castle”) chronographs. You would be forgiven for doing a double-take on that last sentence. Everyone knows that the 7750 family uses stamped steel cam plates to start, stop, and reset the chronograph mechanism not the exotic system of levers that defines the term “column wheel”. But it’s true! Over the last decade, the lowly 7750 has been modified to include a column wheel for haute horology companies like Panerai, Hublot, Longines, and Omega. I began looking deeper and found that ETA wasn’t first to the party with a column wheel version of the 7750 base. In fact, the same feat had been accomplished by movement specialists Alfred Rochat (for Chronoswiss) and La Joux-Perret (for lots of other brands). Those guys even stuffed a rattrapante mechanism in there! Perhaps the most surprising fact I uncovered when digging into these franken-calibres was that ETA/Longines/Omega were quite late to the party. La Joux-Perret was first out of the gate, creating a Valjoux 7753 with no less than two column wheels to enable a rattrapante function. This was first used by Panerai as their OP XVIII and was introduced in March 2005. Later that same year, La Joux-Perret introduced a similar flyback movement for Graham, their calibre G 1742. The next company to take a crack at a column wheel Valjoux movement was Alfred Rochat. Their calibre was introduced to the world in March 2006 as Chronoswiss C.732. Although information is scarce, it appears to me that it retains the cam system of the 7750 family but also has a column wheel for the flyback function. And it appears that Alfred Rochat never gave this movement to any company other than Chronoswiss, though there were quite a few variations made. La Joux-Perret continued their work, however. In March 2007 they introduced another column wheel 7750-based movement, this time for Vulcain as their movement V-50. 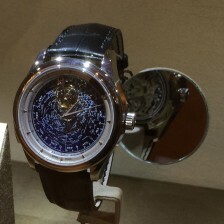 They also began producing decorated versions of the normal 7750 for Hublot. Called the HUB 44, this movement family eventually got its own column wheel version for the Big Bang Cermet in 2008. La Joux-Perret would continue producing special HUB 44 movements in the following years. In 2009, Longines requested a column wheel chronograph movement from Swatch Group supplier ETA. Since ETA’s Valgranges movement family already used the 7750 as its base “tractor” (even for the non-chronograph movements in the A07 family) it was natural for them to start with this base as well. They introduced the Longines-special A08.231 in 2010, a column wheel variant of the 7753 quite different from those already produced by La Joux-Perret and Alfred Rochat. This was renamed A08.L01 and used in a number of Longines Heritage Chronograph models over the next few years as the Longines Cal. 688 and 788. The next big evolution of the Valgranges movement was a Co-Axial version for Omega. Fans of that brand had long since soured on Omega’s 33xx line of column wheel chronograph movements (3301, 3303, 3313) which had been produced by Piguet. These gained such a bad reputation that Omega fans actively advised against buying them! The replacement would be another Valjoux 7750 variant, with the column wheel like Longines but also a Co-Axial escapement. The new Omega calibre 3330 is truly a modern movement, complete with a silicon balance spring, but it’s a Valjoux 7750 at heart. It’s disappointing that Omega chose the 33xx name for it, though, given how widely loathed the earlier 3300 movements were. Still, it’s a great movement for the company’s mainstream models and has this remarkable, if widely overlooked, historical connection to the 7750 series. Omega and Longines couldn’t be more different when it comes to their movements. Where Longines publishes a complete list, including ebauche bases, Omega doesn’t even show an official photo of the 3330. This is especially puzzling since they just introduced a number of watches using this new movement. It would be wrong to reject a movement based on its bones, just as it’s wrong to endorse one for the same reason. The column wheel variants of the 7750 are thoroughly reworked to truly be new movements. But they retain the proven design and parts availability of that original movement. The only truly surprising element of these movements is that their Valjoux base is not widely recognized. I assume the introduction of the column wheel into the Valjoux 7750/3 mechanism will address what I regard as the big fail of the original movement. Based on my own experience with the original movement (I had 3 of them and all do the same) I regard it as unreliable and unfit for use as a chronograph. I therefore also sold my watches with this movement, 7750 and 7751. My gripe with the non column wheel variety was that, if you activate the chronograph and stop and start it many times over without resetting it to zero, the hour chronograph hand will eventually “become confused”, i.e. it will no longer display the elapsed time correctly. I have made this comment on other forums before so, pardon me if you have come across me mentioning that before. Late to the game here but the La Joux-Perret rattrapante variant was also used in a limited run of watches by JeanRichard called the Bressel 1665 rattrapante. It was cased in palladium. Quite a rare bird. Detailed for $29,000 now you occasionally see them for $6,000 or so on the secondhand market.